If you’ve bumped into me anytime lately, you’ve seen my large, black handbag thrown over my shoulder. Every aspect of my life seems to congregate in my purse, so I can probably feed you, assist you in health ailments, offer jokes for your party, and provide solutions to most problems, all which come from the bottom of that purse. Anyhow, that perfect handbag came from H&M years ago. A few weeks ago, my 15 year old daughter and I went to NYC’s Fashion Week. While we were trying to ward off the frostbite, we popped into H&M on my friend’s recommendation. She told me she had purchased her ten year old’s father/daughter dance dress on sale for under $10. I was reminded of why I love that store in the first place. H&M offers great fashion for my Frugal Fashionista budget. I’ve always popped in there for me, but since we had time to wander, I realized that they have an amazing Kids’ section as well. Actually, they have a great variety for every family member. 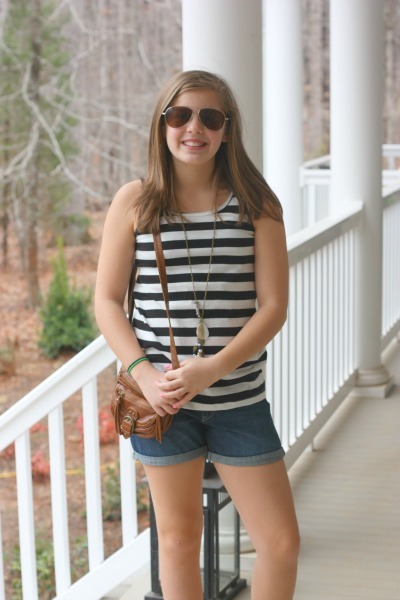 Our 11 year old daughter is the true fashionista of the family. If you follow me on facebook, you know that she is very specific on her fashion opinions, including mine, and honestly, I’ve learn to listen to her because that girl has style. For her upcoming birthday, she has requested a “shopping spree.” (Now that is a very relative term, depending on who you ask.) 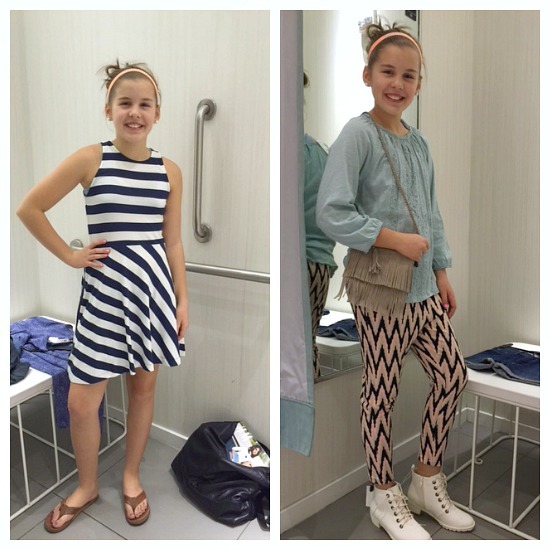 When H&M asked if she’d like to pick out a few outfits, her year was made. We may have stopped in for her, but I stopped in my tracks when I saw these wedges on sale for $5!! I’m picky on who I partner with when it comes to fashion because while I’m all about investing in a few quality pieces, it needs to be affordable. She is growing every month. It’s crazy! Things I buy today will not fit in the fall, so H&M’s girls’ line lets me give her a shopping spree with the most fun trends, yet stay completely functional. Fun, Frugal & Functionality – it’s the best of all worlds. Plus, their sales? Better than my typical stomping grounds. This tank was $3!! I know, I know. They have more tanks with printing on the front. It’s a bit of a drive to our local H&M, so I’ve also been following H&M online. 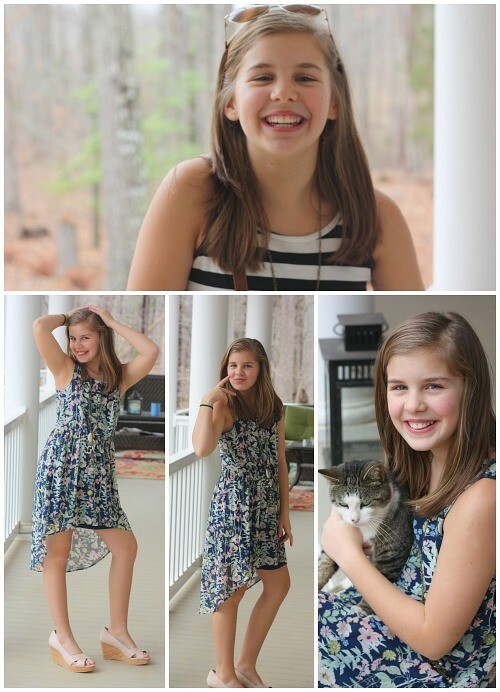 Right now, my daughter is beside herself because their new Spring Line has been launched and cuteness abounds. Since spring fever has hit our family and we’re clearing out draws and closets, we are updating wardrobes. 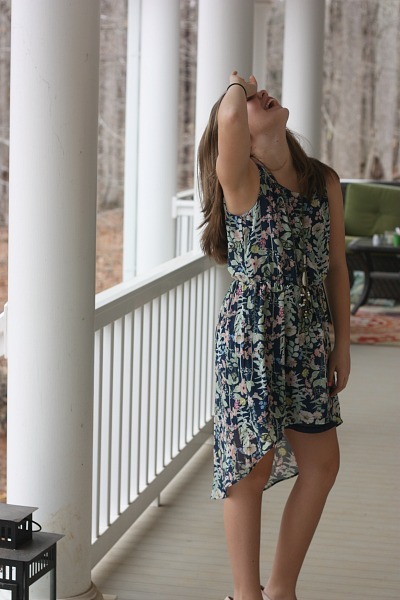 Don’t you just love the cut of this spring dress? I want one in my size. It’s the perfect time to update some new pieces since H&M’s amazing kids sale is going on now, both on-line and in-store. If you’re looking for Easter outfits, this is your place. Many of the little girls dresses are under $5. This gorgeous embroidered top is her favorite. 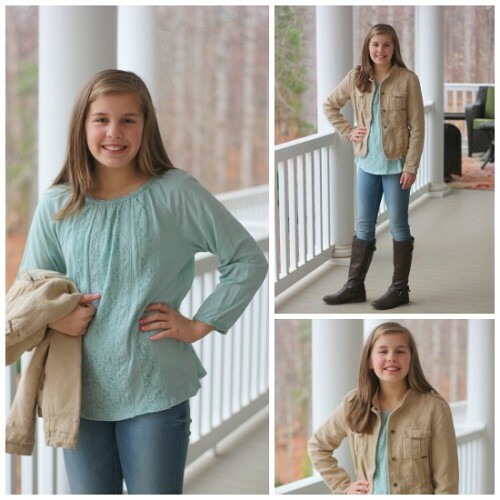 Paired with the skinny jeans she found, it’s great for chilly days or paired with the jean shorts shown above, it will be perfect on summer nights. Her thrifted jacket was a recent find and she was ecstatic at how cute it looked layered with the shirt. The dress purse and adorable boots went back, but she kept these fun, funky and comfortable pants, which she can wear year round. We will end with one of my favorites. When I was planning my trip to Fashion Week, I asked my instagram followers for some wardrobe suggestions. A few mentioned how popular jump suits were this season, but I never got a chance to try one on. I adore this look, plus it’s so versatile. She’ll be able to wear this winter through summer just by throwing on a sweater. The jumpsuits for girls were only $14.95 (plus 20% off during kids sale – $12). I’m eyeing some for me now. Our special blessing nephew was our main fashion director during this entire “photo shoot.” He encouraged Emma to have fun, so we can’t finish without special props to him. Now I get to share the best part! Print a H&M Coupon for 20% off their already low prices. 20 % off coupon for entire H&M Kids’ purchase over $50. Valid in-store 3/19/2015 – 4/8/2015. Print or show this coupon on your Smartphone at time of purchase. Offer valid on kids purchases totaling $50 or more before taxes. To shop online, use code 2968 at checkout. For in-store discount, coupon must be surrendered at time of purchase. Cannot be combined with any other offer, discount, sale, already reduced items, guest designer collaborations or select special collections. No adjustments on prior purchases. Not valid for purchase of gift cards. May not be redeemed for cash or cash equivalent and is not transferable. Valid in US only. Disclosure: This is a sponsored post by H&M, but all amazing clothing picks, plus the extras I bought are all thanks to my daughter’s fashion prowess. So fun. She did great. I haven’t been to HM, but I think that needs to change. 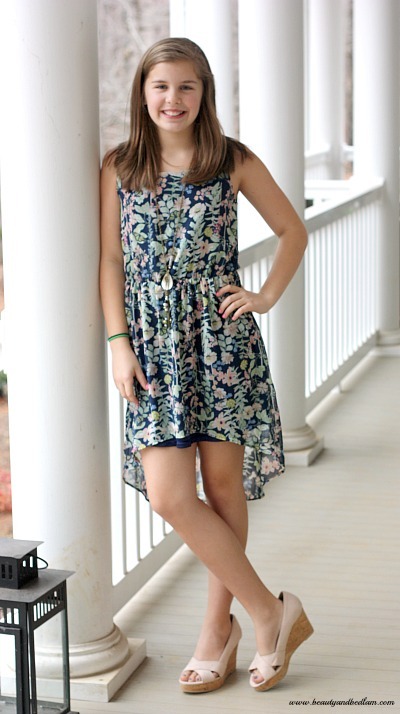 My 13 year old daughter wears my shoe size, and often my shoes. This year she’ll overtake me in height and her feet will be too big for my shoes. It’s bittersweet. We’ve loved H&M since she was a little girl and she’s really got into their junior clothes recently. My daughters will be there soon. IT sure is bitter sweet, isn’t it? I had no idea that their prices are so low. Your daughter looks adorable and I bet she had so much fun on her shopping spree. I remember jumpsuits when I was her age. LOL. I had a pink and white pinstriped long sleeved jumpsuit that I wore with cowboy boots and cowboy hat. Yes, I thought I was so cool rocking that look in the early ’80s. LOL. Love the pic of her and your nephew. 🙂 Adorable. Your daughter looks great in all the outfits. We love H & M!